Sometimes things can seem more profound in the groggy hours of an early morning hangover. There’s a certain specificity to the physicality of those hazy hours spent slowly sipping coffee and trying to keep plain toast from coming back up again. Eyelashes still sticky with the remnants of last night’s mascara, mysterious bruises beginning to yellow on drunkenly knocked shins, words left unfiltered by any semblance of better judgment. 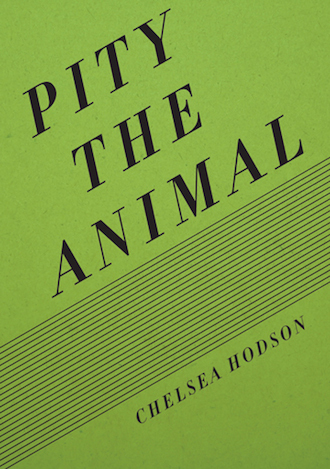 It’s this fact–that we humans are nothing more than a bunch of confused animal bodies–that Chelsea Hodson examines in Pity The Animal. Hodson’s writing is precise in its incision–surgical, almost. Slicing through flesh and tendons and bone, the writer deconstructs the human body, or rather a specific female body: her own. The female body has long been marginalized as an object for the male gaze. Museum walls are adorned with hundreds of portraits of reclining female nudes, women passively posing for some male artist to make meaning out of their naked forms. In this classic scenario, the male artist is the hunter and the female muse nothing but a startled deer. In Pity The Animal, Hodson captures the exhaustion of women’s daily performance for the male gaze. Hodson masterfully stitches together myriad concepts, leaping from the art of retail window displays to Marina Abramović’s performance art to the sexual dynamics of Grand Theft Auto. Unifying these seemingly discordant topics is the presence of Hodson’s own physical form–the vessel that has shaped so much of the writer’s experiences as a human being, an animal, a woman. For Hodson, her body–one desired by men, supervised by society, and commodified by culture–“trailed behind me like a valuable shadow.” For its inhabitants, the female form is a constant reminder that you are being watched, you are being looked at, you are not the one doing the looking. But perhaps there is freedom to be found in these constraints. Perhaps the shackles of surveillance can be reversed in order to instead examine the watchers. Throughout Pity The Animal, Hodson continuously returns to the idea of responsibility. “I spent so much of my youth waiting for something to happen,” Hodson writes. “Unsupervised, I had my choice of dark rooms. I knew which rooms were bad and I entered them anyway. It was a sort of power.” Just as Abramović alleviated herself of responsibility with her performance piece Rhythm 0–in which she placed 72 objects on a table and allowed her audience to use them however they pleased on her own body–Hodson understands the relief of turning the “I” into object. By treating her body as a window display, whether by booking modeling gigs or attracting sugar daddies online, Hodson turns her attention to the ones doing the looking. Hodson becomes the hunter and her audience becomes the animal. It seems almost impossible to write about Hodson without at least mentioning her blog, Inventory, in which the writer attempts to catalog everything she owns. Every material object of Hodson’s is fastidiously documented through a series of self-portraiture. Any tangible belonging is fair game: tinted moisturizer, sharpies, books, pasties, latex tape, tax returns. Just like the objects that Hodson catalogs for Inventory, Pity The Animal is ultimately a story of possession: to be an object desired, acquired, owned. Pity The Animal is not a tale of absolutes. It is a tale of “maybes” and “sometimes.” It is an excavation, an archeological dig, into a graveyard of multiple meanings. The female body is constructed anew, reincarnated each day. Everyday it is looked at and looks out. The window display is redone, the shoppers pass by. But with this work, Hodson has blurred the line between the hunter and hunted, responsibility has shifted, and the previously defined have become only possibilities.